Distortion connotes contortion, deformity, malformation, mutilation, twisting, losing shape and so on. Here, how, why and what for such distortion has taken place in historical writings on Indian history in interpreting historical processes and happenings in historical context has to be critically analyzed. The very word distortion and its shades of meanings and connected expressions prove that such actions could have taken place directly and indirectly, with or without motive, internally and externally because of thousands of years of time and people involved. 2. Loss of records and archaeological evidences. 3. Rule by the aliens, which had been politically and religiously motivated. 4. Historiography handled by the engaged professional and non-professional groups. 5. Quick and hasty chronology decided and fixed. Coming to the question of “Indian History”, many times “India” of 3000 BCE is interpreted thinking “India” of 300 CE, 2000 BCE as 2000 CE and so on. Reflecting present on the past is an historical idiosyncrasy without understanding the historical factors involved behind each period. Many times, even great historians and scholars write that people have been like this today and therefore, they must have been there like that in 3000 BCE also. The climatic, meteorological, geological, geographical, political and other factors are totally ignored. As for as “history” is concerned, there has been an attitude developed and established that “we are only historians and other not”. Are all history teachers, lecturers and professors are “historians’? Definitely, not. The definition of history changes according to modern times. The ideological interpretation of historical processes have been another feature of Indian historiography, which created bias and prejudice with pre-conceived notions, hypotheses and theories leading to distortions. The time involved in Indian history has been enormous perplexing modern historians, but it is not the fault of India or its time but that of the modern historians, as they could not perceive, conceive and comprehend such processes involved. As scientific studies day by day reveals the antiquity of man and its activities on the earth, the existence of the earth and other planets for million of years, the “historical perspective” of “history” of “modern historian“ living in different time and place, is limited, restricted and curtailed and thus censored also. The Itihasas (Ramayana and Mahabharat) and Puranas (the original 18 Puranas compiled by Vyasa or attributed to Vyasa) have been the Indian historical records. There have been hundreds of specific references about the description of the world with continents, oceans, mountains, rivers etc., recorded in the Itihasas and Puranas, though they appear to be non-scientific for the modern minds, but they have been scientific containing scientific data and information. The modern minds may think them as myth, fables or even bundle lies, because of the orchestrated propaganda made about them. If the same yardstick is applied to the so called Greek historical records, they are more myth, fables and bundle of lies, as has been vouchsafed by the Greeks and western scholars themselves. Therefore, the data and information found in Itihasas and Puranas need not be doubted. If a researcher works with open mind, he can easily find out the truth. Indian historical records, though, modern scholars do not accept them 100% historical (and of course, no historical record is 100% historical, which is known historical fact) have recorded such a lengthy human history. One specific example is discussed here. Valmiki has mentioned about three-tuskered elephants, different horses etc. How Valmiki could have seen or at least imaginatively visualized or otherwise the millions of years old creatures? The issue is discussed as follows. Valmiki a Liar or Imposter or Forger? 1. The grand palace of Ravana was protected by many strange animals. 2. Certain characteristic horses were sneighing. 4. Protected fat animals and birds were also there. 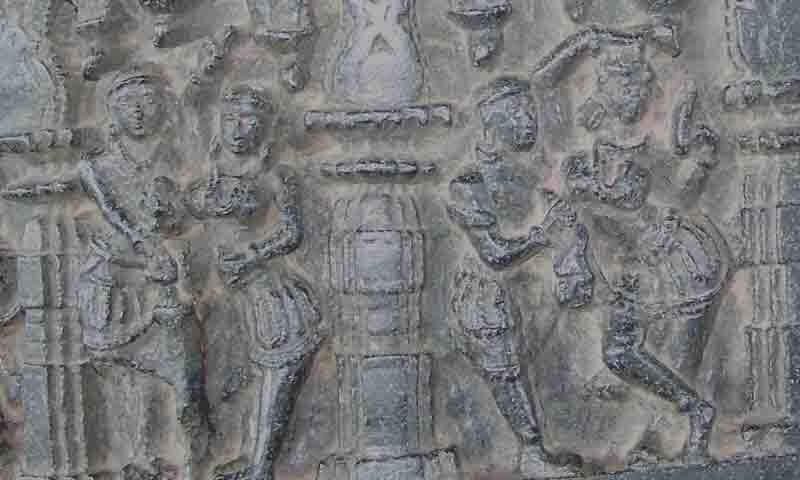 The first four depictions are in Sundarakanda (4.25-30) and the fifth one also in Sundarakanda (9.5) of Valmiki Ramayana. A Jurassic Park in Ramayana indeed! Can Valmiki be dubbed a liar or Steven Speilsburg has copied the idea from Valmiki or directly from Ravana? Or Valmiki copied these details from the modern book of science living in 20th century? He resurrected and came to forge or interpolate to please the western writers? Or some wicked and history-senseless Brahmins interpolated just to appear just like that to claim antiquity? All concerned scholars have to answer honestly. According to modern scientists, the big elephants with big jaws and small teeth are called Tetrabeloton and others Dyanothiayar, which lived about 13 to 135 million YBP. The elephants with big ears and lengthy and bent tusks lived about 63 to 135 million YBP during cretaceous period. The elephants with dense hair, bent tusks lived about a million YBP during Pleistocene period. These type of animals have been depicted on the horns of deer known as Arknecian. As the men who drew such pictures on the horns lived before 12,000 years and scholars accept that they must have seen and drawn, definitely, Valmiki, the poet or the writer who wrote Ramayana with such description must have lived during the period to see and describe. As Indian archaeologists and historians argue that the poet or writer of Ramayana must have seen the later day monuments, buildings and sculpture to incorporate such descriptions, he must have seen the animals of such 65 to 135 million YBP and described in his Ramayana. Incidentally, this period comes to Tretayuga, where, the bridge has also been dated now as man-made. Paleantology, archaeology and connected fields and subjects have been perceived, conceived, evolved and developed only during the last 50 to 150 years. Then, the dating methodology has been put into practice to date the samples on relative / prepared scale. But, as Valmiki or the poet has given such details, they cannot be brushed aside as myth. The date of Valmiki or his work also cannot be underestimated without going into the details. That whoever may be could depict such details in his poem definitely puts him at the period of 12,000 when the cavemen drew on the deer horns. Or at the worst, he must have known the details 2000 to 5000 YBP. How, that, he could get such knowledge? Without taking this type of important evidences, scholars should not and could not come to some hasty conclusions. The same situation could be noted in the case of the “Three Tamil Sangams”. The Tamil tradition has been very consistent about the existence of such academies of poets, who were patronized b the Pandyan Kings, but modern historical mind refuses to accept such narrative evidences without material evidences. The NASA photo of the “man-made bridge” connecting Rameswaram and Sri Lanka with the note that it was built about 17,50,000 YBP published recently in newspapers is not new one many think. Similar photo was published in 1993 itself (Indian Express March 25, 1993) with a report under the caption ‘Rama’s bridge on NASA photo’ (Indian Express, March 24, 1993). In fact, the report was based on two photographs displayed at the Pragati Maidan, New Delhi at that time one that of NASA taken September 14, 1966 displayed with the caption “the mythological land bridge between India and Sri Lanka through Rameswaram and Jaffna” and the other one taken by IRS-IA and enlarged read “Computer-altered image shows the mytrhological land bridge between India and Sri Lanka through Rameswaram and Jaffna”. Therefore, it is evident that after 36 years, USA or the persons behind have decided to change “the mythological land bridge between India and Sri Lanka through Rameswaram and Jaffna” to “man-made bridge” implying that Ramayana period is not 5 millenium BCE, but perhaps goes back to Tretayuga (17,28,000 YBP), as has been held by the Puranas. Anyway, now, it has to be decided historically with the astronomical methods. The date of Sri Rama has been determined based on astronomical, literary and other evidences. Astronomical methods invariably fix the date of Sri Rama between 4430-4330 BCE period. Western scholars differ in their methods. Even in the method of literary evidence, they put Ramayana after Mahabharat and tried to arrive at date based on the date of compilation, editing and writing of manuscripts. Such methodology has to be scrutinized critically and thoroughly. These details are given, because the dating is connected with the animals mentioned above. The Tretayuga dating matches with the geological datings of the modern scientists. As Valmiki describes such animals, can we imagine that Valmilki existed 17,50,000 YBP to see them and record in his Ramayana? Historians have to decide. This is quite possible considering the time involved in Indian history as pointed out above. Besides the Islamic iconoclastic destruction and the Christian vandalism with the blessings of the invaders or settled rulers, there had been systematic looting, smuggling and impairment of records and archaeological evidences. Otherwise, the foreign museums could not have more Indian archaeological evidences than the Indian museums have now. There had been planned taking away of manuscripts, palm leaves, books, charts, diagrams, drawings, paintings, instruments etc., by the engaged scholars, missionaries and official “exporters” of East Indian Company, that is why the foreign archives have more collection of such historical documents that that of Indian counterparts. In the case of Muslim interaction with such period, during Abbasid period many scholars and books were imported into Arabia for translating and writing in books in Arabic from Sanskrit. Later, straight away, the Sanskrit books were translated and written in Arabic without acknowledging the Sanskrit or Indian sources. . In fact, most of the Indian source materials had been made to disappear or irrecoverably lost. Many thousands of astronomical and mathematical tables were lost in such interactions. The fate of hundreds and perhaps thousands of scholars exported or went there is not known. Whether they returned to India, were killed as the rulers did not want the knowledge to spread to others, run away fearing the persecution, disappeared hiding their identity or converted to Islam for various reasons. Incidentally, Sufi movement appears in the Middle East after that time only. Indus Valley Civilization, Bahrut, Udayagiri, Hathighumpa evidences prove how the time could have played a havoc in the slow destruction i.e, erosion of the archaeological evidences. Illegal excavation, smuggling and stealing away of already excavated sites have been the feature of IVC, now situated in Pakistan. The Talibanized groups have already given instructions to erase all the acts and signs of Satan i.e, to destroy all the figures, idols and such things. Or sell them to the antique Collectors, get money and invest for Jihad and of course, it is faithfully done. The Udayagiri art and sculpture resemble Bahrut, that is why the modern scholars themselves accept that they belong to 200 BCE. But, definitely, they are before Bahrut, because, the natural erosion and withering away of the sculptured stone has been more and clearly visible even now. If anybody goes through the Research Journals about the discussion on these monuments, it can be noted that some of them take them to pre-Asokan period and some others bring back to 2nd and 1st centuries, as no evidence could go beyond Asoka, Mauryan the period! The Hatighumpa – Kharavela inscription too has been a matter of controversial reading and interpretation, as it has been mutilated by nature itself, because of time. Scholars place Kharavela from 400 BCE to 100 BCE. Incidentally, Kharavela talks about the existence of a confederacy of Tamil Kingdoms existed 1300 years before him i.e, in 1700 BCE or 1400 BCE. But, the modern scholars keep silence or cut down the chronology to 300 years. Kharavela has lied or the modern scholars are too smart? The British divided the “Indian history” into Ancient, Medieval and modern periods. Later it was changed to Hindu, Mohammedan and British periods. Indians were divided into “Aryan” and “Dravidian” races. The “Mohammedan” or Muslim rulers too have adapted and adopted such bias and prejudice in their own way i.e, the Islamic way. “Indian History as Told by Indian Historians” reveal such tendencies. Dealing with this type of topics might be dubbed as “communal” and so on, but it is an undeniable bitter truth that the Muslims and Christians have destroyed many temples, idols, sculptures and artistic evidences, because they have against their scriptures. If one analyze critically the psychology of Iconoclasm and Iconogenesis, the truth would be revealed. Very often, scholars, particularly the so called art historians and experts discuss about the wonderful artistic skills of some rulers, dynasties and people group, who themselves happen to be the destroyers of artistic sculptures, artifacts, monuments and temples. How an iconoclast could produce icons? This tendency should be carefully noted in historiography. The present Indian history has been written by the British administrators with the main qualification that they knew and write what they want in English well. However, their efforts and steadfastness are not under estimated or denigrated, but only the motive behind is questioned in the historiographical context. Even today there have been hundreds of politicians in India and people know their background and case history. Still, some of them claim that during their reign only many temples were renovated, temple cars run, and so on censuring Hindu tradition, heritage, culture day in and day out. Similar type of interpretation is given to rulers like Aurangazeb, Tipu Sultan and others that they have given grants to build temples or destroyed temples because the Hindus were doing nonsense there. However, the do not explain why they did not do the same to the mosques. In fact, mosques had been only built at the sites where the destroyed temples stood. 2. Considering every historical happening before that as pre-history or unhistorical (thus thousands of Indian history has been simply dubbed as myth). 3. Reading, interpreting and fixing different dates of various Kings and dynasties arbitrarily without any independent datings. 4. Dubbing the inconvenient Kings and others as myth (Vikramaditya), ignoring them altogether or sidetracking by glorifying some Kings as Emperors and “The Great” (Asoka, though he conquered only few parts of India, but Kharavela conquered most of the parts of India). 5. Compressing all such rulers and dynasties within 200 / 300 / 400 years and placing them after 326 BCE (all Indian astronomers – Aryabhata, Bhaskara, Lalla, Varaha Mihira, etc are made to crowd around 500 CE). 6. Sloganization of historical personalities, events and places – Kautilya is the Indian Machaeveli, Chandragupta is Indian Napolean, Gupta period is “Golden Era”, the “Nine Gems” (though the so called “Nine Gems” belong to different periods and their dates are not determined coclusiuvely), etc. 7. Taking Puranas as source for getting the names of Kings, Kingdoms, boundaries, dynasties and their exploits at one side, but condemning, blaspheming and disparaging them as myth, forgeries and so on at the other end. 8. The inscriptional dates have not been deciphered independently but relatively. The Regnal Years mentioned in Kharavela, Asokan, Gupta and other inscriptions have been fixed relatively. Many times, though, 500 BCE / 400 BCE were obtained in their calculations, they were ignored as they went beyond 326 BCE mark! 9. The Monuments have not been dated scientifically but based on styles and some generalized artistic features. 10. As the IVC has been dated to 3500-2500 BCE, wedge has been created in interpreting the script as Aryan or Dravidian, Sanskrit or Tamil and so on. John Faithful Fleet, the only person who has been responsible for fixing certain dates, which have been the datum for fixing other dates, has been unfortunately more faithful to his country than to India. No doubt, he has rummaged through the fleet of inscriptions faithfully, but it had been only johnnycake to the British. He was Johnny-come-lately in fixing the dates unilaterally and relatively without considering other evidences. As distortions in Indian history have been due to different factors, only the factors related to human agencies appear to pose great threat to objective historiography in presenting the facts to the public instead of tainted with ideology and so on. First, let the facts be known the public and let them decide. Without placing the facts to them, but go on interpreting the facts according to their ability of interpretation do not justify such exercise. As now print and electronic media is open, the facts could be presented to the general public easily so that they could understand the truth behind the facts. B. List of manuscripts, books etc., destroyed. C. Instances of archaeological evidences destroyed. D. Instances of archaeological evidences smuggled out of India. 1. Nabin Kumar Sahu, Kharavela, Orissa State Museum, Bhubaneswar, 1984. 2. Jaina Chhotelal, Khandagiri-Udayagiri Caves and Kharavela Inscriptions (2nd Century B.C), Calcutta, 1948. 3. Sasikanta, The Hathigumpha Inscription of Kharavela and Bhabru Edict of Asoka, A Critical Study, New Delhi, 1971. 4. S. Iyer, The Hathigumpha cave Inscriptions of Kharavela, Indian Antiquary, Vol.XLIX (1920), pp.43-52. 5. A. Chand, Date of Kharavela, Journal and Proceedings of Royal Asiatic Society (1923), p.395. …………., Date of Kharavela, Orissa Historical Research Journal, Vol.III, No.2, pp.84-99. 6. K. P. Jayswal, Hathigumpha Inscription of the Emperor Kharavela (173 B.C to 160 B.C), Journal of the Bihar and Orissa Research Society, Vol.III (1917), pp.425-473. 7. R. Mukherji, Kharavela and Tramira Daha, Journal of Asiatic Society of Bengal., letters, Vol.VII, Nos.3-4 (1965), pp.129-131. 8. K. A. Nilakanta Sastri, The Colas, University of Madras, Madras, 1984, pp.30-31, 35-36. Chidambaram, Part – I (1954) and Part – II (1957). 9. K. V. Ramakrishna Rao, Kharavela and Karikala, a paper submitted to the XXIIIrd session of South Indian Congress to be held at Tiruchirappalli from January 31 to February 2, 2003 (included in the Abstract Volume).